The Catalyst Surf Shop in San Clemente has quite a bit of history behind it. It was once a church, and then was owned by several local shaping legends over the year:, Herbie Fletcher, Rick James and Jimmy Nudo. 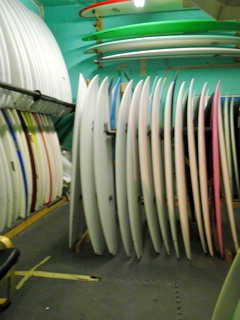 The owners of Lost Surfboards now own the shop, and it is the best place around to go check out the latest Lost shapes. I grew up in the area and have been going to that shop for over 15 years now. I used to go look at all the cool artwork on the Lost Surfboards when I was a little kid. This surf shop has come a long way even over the last 15 years and I can vouch for that. 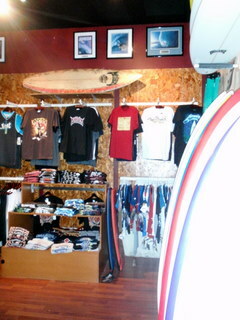 For a very detailed history of the Catalyst Surf Shop, check out their website. 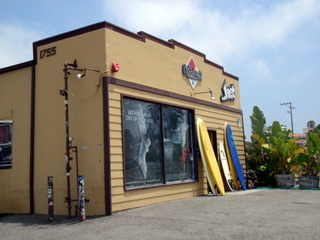 The Catalyst Surf Shop used to have maybe a hundred surfboards or less on hand at any given time back when I was a kid. They had a small selection of Lost clothing for guys, and the basic accessories you would need for a new surfboard. Now, this surf shop has it all. There is a huge selection of Lost clothing for guys and girl and there is a whole skateboard section where you can purchase complete skateboards and everything else you need to skate. Their selection of accessories for surfboards is huge, and there is a ton more surfboards than there used to be. The surfboards are the main reason I have grown up coming to the shop. In my opinion, Lost Surfboards used to be very similar to other mainstream surfboard companies, but in recent years they have become one of the most unique brands of surfboards. Their new models like the Rocket, the Stealth, the Round Nose Fish, the Shark, and lots of other designs are so unique compared to other shapes on the market. The Catalyst Shop is one of the places where the innovative shaping takes place, and you can even look through a window into the shaping room to watch it all go down. Recently, the Catalyst Shop has been taking in more and more used boards, many of which are trade-ins from the professional team. For those of us who are a bit starved for money at the present time, these boards are the ones we are most interested in. They have a constantly evolving selection of used Lost Surfboards and other brands that are still in really good condition. Since moving back home to California for the summer, I have made the Catalyst Shop a weekly stop of mine to see if they have any new used surfboard deals I might be interested in. They almost always do. The Catalyst Shop has been a big part of my life and I recommend anyone who is in town to come check it out.